I have about 129 cards to send. Here's one that I made at work the other day. I am particularly proud of it because of the techniques I used. And I designed it myself!! I stamped three flourishes in the corner (and one in the opposite diagonal corner) with Starlite Silver ink, then embossed with holographic embossing powder. 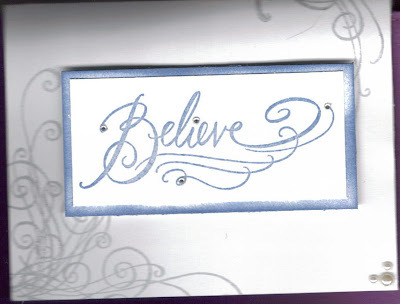 Next I stamped "Believe" in Blue Chalk Ink and embossed with clear. I added four small gemstones to embellish. To create the mat, I edged the sides of the mat with the Blue Chalk Ink and then embossed with clear. (That was the coolest part!!) I adhered the message with four pop dots. Finally, I finished the bottom right corner with 3 pearls. Shazam! It's fabulous. Sorry the scanner doesn't do it justice.